Penetrating spine injury (PSI) forms the third most common cause of spine injury, only next to road traffic accidents and fall. Gunshot wound (GSW) forms the major bulk of PSI. Due to easy availability of firearms and antisocial behavior, GSW which were predominant in military population is now increasingly seen in civilized society. 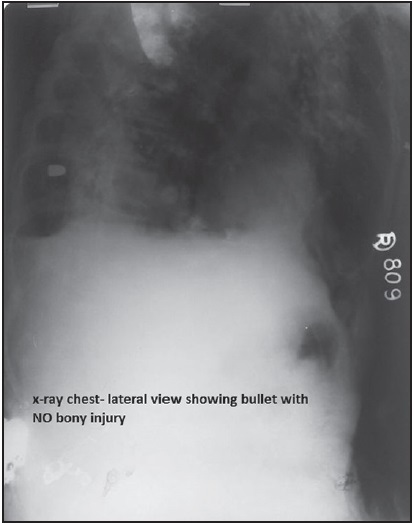 Here, we present a detail case review of unique case of civilian GSW indirectly causing complete spinal cord injury due to shock wave generated by the bullet, along with its systematic management. Aims: The aims of our study were to investigate the distribution of cervical vertebrae anomalies (CVAs) among dental Angle Class I, II, and III malocclusions in Turkish population and whether a correlation between CVA and dental malocclusion. Materials and Methods: The study was performed on lateral cephalometric radiographs which were taken at the Department of Orthodontics, Faculty of Dentistry, Kirikkale University. The final sample of 318 orthodontic patients was included in the study. Dental malocclusions were performed according to Angle classification. CVAs were categorized: (1) fusion and (2) posterior arch deficiency (PAD). The Chi-square test was used to the analysis of the potential differences among dental malocclusions. Results: The final sample of 318 patients was examined. CVA was observed in 42 individuals (of 26 [8.17%] had fusion and 16 [5.03%] had PAD), with a frequency of 13.2%. Of the 26 fusion defect, 8 (30.7%) had Angle Class I, 8 (30.7%) had Angle Class II, and 10 (38.4%) had Angle Class III malocclusion. Of the 16 PAD, 8 (50%) had Angle Class I, 8 (50%) had Angle Class II but no patients with Angle Class III malocclusion was observed. The distribution of dental malocclusions regarding CVA was not statistically significant (P = 0.076). Of these 42 individuals with CVA, 52.3% (15 fusions and 7 PAD) were females and 47.7% (11 fusions and 9 PAD) were males. Conclusion: In our study, the prevalence of fusion and PAD were found 8.1% and 5.0% in Turkish population, respectively. Besides, no statistically significant correlation between CVA and Angle Class I, II, and III malocclusions were found. Our findings support the studies showing no gender dimorphism. Study Design: Case series. Objective: To reduce the cost of minimally invasive spinal fixation. Background: Minimally invasive spine (MIS) surgery is an upcoming modality of managing a multitude of spinal pathologies. However, in a resource-limited situations, using fenestrated screws (FSs) may prove very costly for patients with poor affordability. We here in describe the Nizam's Institute of Medical Sciences (NIMS) experience of using routine non-FSs (NFSs) for transpedicular fixation by the minimally invasive way to bridge the economic gap. 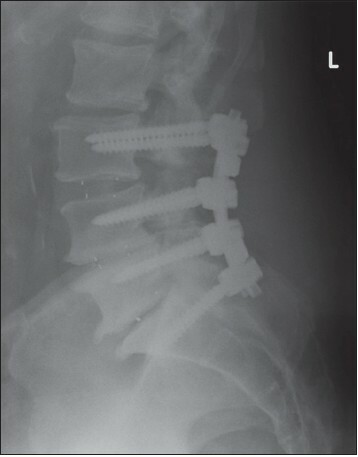 Materials and Methods: A total of 7 patients underwent NFS-minimally invasive spine (MIS) surgery. Male to female distribution was 6:1. The average blood loss was 50 ml and the mean operating time was 2 and 1/2 h. All patients were mobilized the very next day after confirming the position of implants on X-ray/computed tomography. Results: All 7 patients are doing well in follow-up with no complaints of a backache or fresh neurological deficits. There was no case with pedicle breach or screw pullout. The average cost of a single level fixation by FS and NFS was `1, 30,000/patient and `32,000/patient respectively ($2166 and $530, respectively). At the end of 1-year follow-up, we had two cases of screw cap loosening and with a displacement of the rod cranio-caudally in one case which was revised through the same incisions. Conclusions: Transpedicular fixation by using NFS for thoracolumbar spinal pathologies is a cost-effective extension of MIS surgery. This may extend the benefits to a lower socioeconomic group who cannot afford the cost of fenestrated screw (FS). Background: Management of type II odontoid fractures in elderly remains controversial to whether surgical treatment is favored over conservative one. This is a study of geriatric patients with asymptomatic type II dens fractures who after sustaining a fall were initially evaluated at community hospitals. They were placed in a rigid collar and were followed up in a spine clinic. Purpose: To assess the reliability of treating very old patients with type II dens fracture conservatively and whether surgical intervention if needed would affect the clinical outcome. Study Design: Retrospective study with the literature review. Patient Sample: Consecutive patients above 80 years of age, who sustained a clinically asymptomatic type II dens fracture and were observed after a conservative treatment plan, was initiated. Outcome Measures: Outcome measures included self-reported worsening neck pain, neurological function, and radiographic measures over the follow-up period. Materials and Methods: A retrospective clinical analysis of 5 active geriatric patients with type II asymptomatic dens fracture. After evaluating them, treatment options were discussed with patients and their family members. The decision was to continue to follow them with a rigid collar very closely since they were reluctant to undergo any surgical procedure. Results: Patients were followed for an average of 29 months. They were observed for any worsening neck pain, neurological deficit, or deterioration of fracture on follow-up imaging studies. At last follow-up, 2 of 5 patients continued to be asymptomatic, the 3 rd died of unrelated causes while 2 others required surgeries at least 1-year post injury. Conclusions: Treatment of type II dens fractures in the elderly is controversial. Independent elderly patients who are asymptomatic at presentation may be safe to be followed up very closely with a neck brace and serial X-ray. Converting to surgical treatment can be done safely when needed without affecting the overall clinical out. Background: Spinal meningioma with ventral attachment is a challenging pathology. Several technical modifications have been proposed to secure safe and precise resection of these tumors. 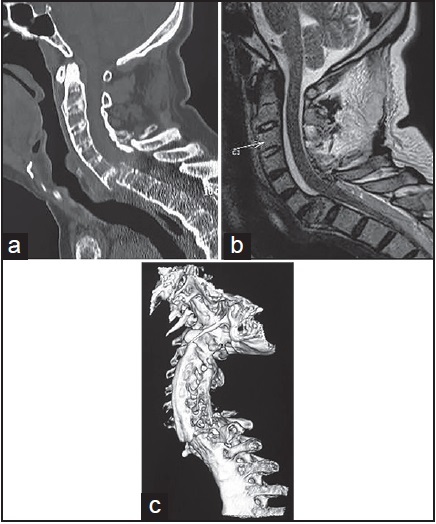 Materials and Methods: This retrospective study focused on the precise and safe surgery of spinal meningiomas with strictly ventral attachment of cervical or thoracic spine. The surgical technique included a lateral oblique position for the patient, laminectomy with unilateral medial facetectomy on the tumor side, and spinal cord rotation with the dentate ligament. The neurological status of patients was assessed using the modified McCormick functional schema (mMFS) and sensory pain scale (SPS) before and at least 3 months after surgery. Patients were followed-up for a mean of 23.7 months. Tumor removal was graded using the Simpson grade for removal of meningiomas, and the extent of excision was confirmed using early postoperative magnetic resonance imaging. Results: Simpson grade 1 or 2 resections were achieved in all cases. No major surgery-related complications were encountered, postoperatively. The mean mMFS score before surgery was 3.1, improving significantly to 1.7 after surgery (P < 0.05). The mean SPS score before surgery was 2.4, improving significantly to 1.6 after surgery (P < 0.05). 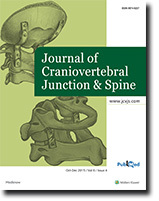 Conclusions: This surgical technique offers a posterolateral surgical corridor to the ventral canal of both cervical and thoracic spine. The present preliminary analysis suggests that functional outcomes were satisfactory with minimal surgery-related complications, although considerable surgical experience is needed to achieve a high level of surgical confidence. 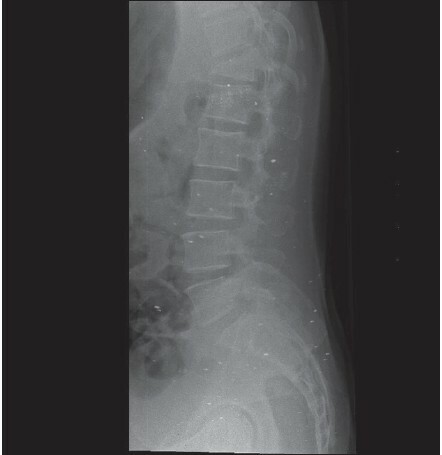 Objectives: To report unique cases of Ogilvie's syndrome (acute intestinal pseudo-obstruction) following posterior spinal instrumentation in thoraco lumbar trauma. Materials and Methods: A single centre retrospective study. We reviewed the surgical data of 420 patients who underwent thoracolumbar spinal surgery over a period of four years. Two patients who developed post operative Ogilvie's syndromes were identified. Results: The clinical presentation and blood investigations ruled out any infectious pathology. Computed tomography scans ruled out the mechanical obstruction. All patients improved with conservative management. Conclusion: Ogilvie's syndrome should be considered as a differential diagnosis in patients with postoperative significant abdominal distension who had undergone posterior instrumentation for spinal trauma. Early recognition and appropriate conservative treatment would be necessary to prevent complications such as bowel ischemia and perforation. Background: Lumbar fusion is a proven treatment for chronic lower back pain (LBP) in the setting of symptomatic spondylolisthesis and degenerative scoliosis; however, fusion is controversial when the primary diagnosis is degenerative disc disease (DDD). 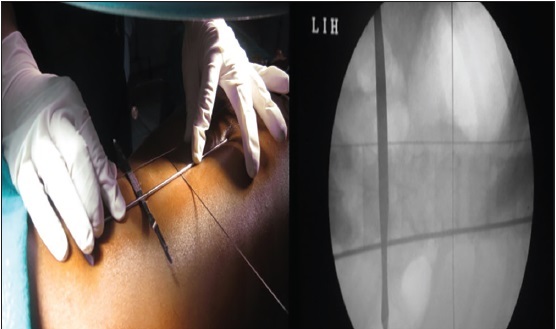 Our objective was to evaluate the safety and effectiveness of lumbar fusion in the treatment of LBP due to DDD. Materials and Methods: Two-hundred and five consecutive patients with single or multi-level DDD underwent lumbar decompression and instrumented fusion for the treatment of chronic LBP between the years of 2008 and 2011. The primary outcome measures in this study were back and leg pain visual analogue scale (VAS), patient reported % resolution of preoperative back pain and leg pain, reoperation rate, perioperative complications, blood loss and hospital length of stay (LOS). Results: The average resolution of preoperative back pain per patient was 84% (n = 205) while the average resolution of preoperative leg pain was 90% (n = 190) while a mean follow-up period of 528 days (1.5 years). Average VAS for combined back and leg pain significantly improved from a preoperative value of 9.0 to a postoperative value of 1.1 (P ≤ 0.0001), a change of 7.9 points for the cohort. The average number of lumbar disc levels fused per patient was 2.3 (range 1-4). Median postoperative LOS in the hospital was 1.2 days. Average blood loss was 108 ml perfused level. Complications occurred in 5% of patients (n = 11) and the rate of reoperation for symptomatic adjacent segment disease was 2% (n = 4). Complications included reoperation at index level for symptomatic pseudoarthrosis with hardware failure (n = 3); surgical site infection (n = 7); repair of cerebrospinal fluid leak (n = 1), and one patient death at home 3 days after discharge. Conclusion: Lumbar fusion for symptomatic DDD can be a safe and effective treatment for medically refractory LBP with or without leg pain. Purpose: The purpose of this study is to compare the effects of two different growth guidance techniques (dual growing rod and vertical expandable prosthetic titanium rib [VEPTR]) on shoulder balance, in the surgical treatment of congenital scoliosis. 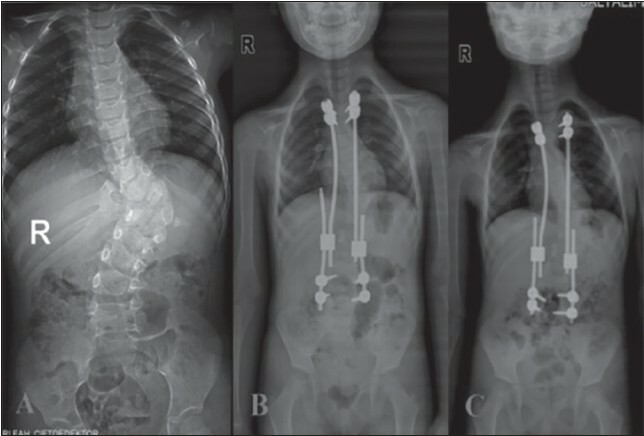 Materials and Methods: Thirteen patients who were operated due to congenital scoliosis are divided into two groups. The coracoid height difference and clavicular tilt angle difference were measured on standing anteroposterior X-ray images in the preoperative, early postoperative periods, and during the last follow-up. Results: Clinical improvement in shoulder balance was obtained in VEPTR during the last follow-up, but there was no significance in the comparison among the two groups during the last follow-up. Conclusion: The effect of the growth guidance techniques on shoulder balance positively contributes in the surgical treatment of congenital scoliosis. Objectives: Our present study aims to assess the short and long-term postoperative outcome of microscopic interlaminar decompression from a neurosurgical center in a developing country and also aims to further determine any predictors of functional outcome. Materials and Methods: All patients with moderate to severe symptomatic stenosis undergoing elective posterior lumbar spinal decompression were prospectively enrolled in a database. Preoperative, 2 weeks and 2 years postoperative Oswestry Disability Index (ODI) scores were determined for all patients. These scores were retrospectively compared using repeated measures analysis of variance. Further, linear regression modelling was applied to determine the effect of preoperative ODI, body mass index, age, prior physiotherapy, duration of symptoms, and single or multiple level decompression on the change in ODI at 2 weeks and 2 years follow-up respectively. Results: A total of 60 consecutive patients (40 males, 20 females) were included for statistical analysis. The percentage of patients with a minimum clinically important difference (MCID), using an ODI threshold value of 10, was 86.7% (n = 52) at the 2 weeks postoperative follow-up. At the 2 years follow-up assessment, 3.3% (n = 2) patients who had earlier not achieved MCID did so, 78.3% (n = 47) of patients were found to have a change in ODI score of <10 or no change, while 18.3% (n = 11) reported a deterioration in their ODI scores. 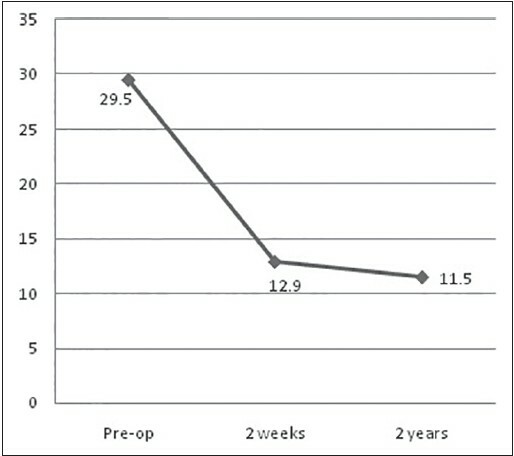 The preoperative ODI score was an independent predictor of change in ODI score at 2 weeks and 2 years respectively (P < 0.0005). The duration of symptoms prior to surgery was found to predict the change in ODI at 2 years follow-up (P = 0.04). Conclusion: The evidence regarding the long-term and short-term efficacy of microscopic interlaminar decompression in symptomatic lumbar stenosis is overwhelming. Preoperative ODI scores and duration of symptoms prior to surgery can predict postoperative outcomes. Aims: In the treatment of thoracic insufficiency syndrome, the main aim is to maintain spinal and thoracic growth in order to continue respiratory functions. Vertical expandable prosthetic titanium rib (VEPTR) device application is a method of choice especially in the congenital cases with a thoracic deformity. In our study, we evaluated the effect of VEPTR on growth in congenital scoliosis. Materials and Methods: Four female patients in whom VEPTR was applied were retrospectively evaluated. Anteroposterior (AP) and lateral Cobb angles that were measured preoperatively and during the last control, space available for lung (SAL), T1-S1 and T1-T12 distances, coronal and sagittal balances were compared. Results: Four female patients in whom VEPTR was applied were retrospectively evaluated. AP and lateral Cobb angles that were measured preoperatively and during the last control, SAL, T1-S1, and T1-T12 distances, coronal and sagittal balances were compared. Conclusions: VEPTR may provide a good correction, and we observed a growth in the spine height and SAL following the treatment of congenital deformities. Long-term, multicenter, prospective studies that compare the spinal height, respiratory functions, the severity of the deformity, and the spinal balance are required in order to evaluate the efficacy of VEPTR. Spontaneous vertebral artery dissection (VAD) is relatively rare but an important cause of posterior circulation stroke. 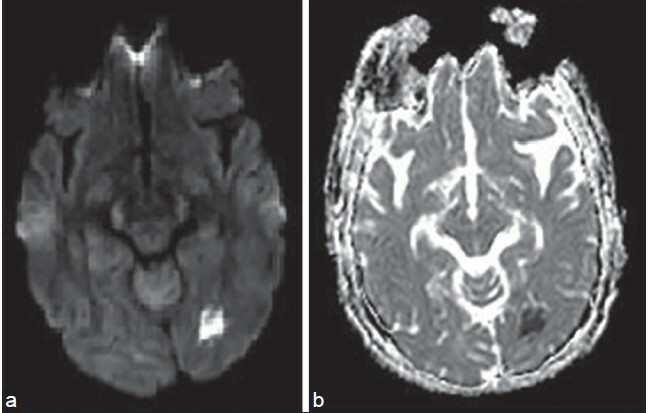 A 46-year-male complaining of sudden onset headache, neck pain with right-sided neuro deficit in the form of hemiparesis was evaluated by contrast magnetic resonance imaging and dual-energy computed tomography (CT) and brain neck angiography which revealed a short segment extracranial left-sided VAD, associated with acute infarct in the left occipital region. The patient was managed conservatively and followed up for 6 months. Follow-up CT angiography after a period of 6 months revealed the near complete resolution of the arterial dissection in left vertebral artery. Acute management of hangman fracture is well described; however the surgical management of neglected hangman fracture has not been described in literature. 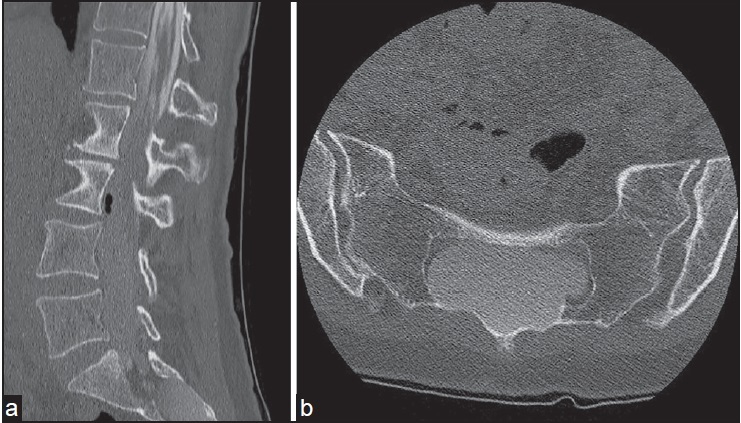 We report the surgical management of an untreated hangman's fracture. A 30-year-old male had fallen from a tree 12 weeks back. Patient presented with cervical myelopathy and restricted neck movements. Radiographs and computed tomography (CT) scan revealed fracture of pars interarticularis of axis with Grade III C2-C3 spondylolisthesis with localized kyphosis of 33°. Gentle reduction under general anesthesia (GA) failed to improve the alignment. Patient was operated in three stages in a single setting. In Stage I, release of contracted anterior structures and C2-C3 discectomy was done in supine position followed by C2-C3 posterior fixation and fusion in Stage II. C2-C3 interbody bone grafting and anterior plating completed the third stage. C2-C3 interbody fusion was seen at 5 months and a CT scan at 18 months postoperative confirmed fusion and maintenance of alignment. The satisfactory outcome in our patient leads us to believe that anterior-posterior-anterior is the appropriate surgical approach for treatment of such patients. Giant cell tumor (GCT) is a benign aggressive tumor, which affects axial as well as a peripheral skeleton. It affects epiphysis of long bones and can result in pathological fractures. 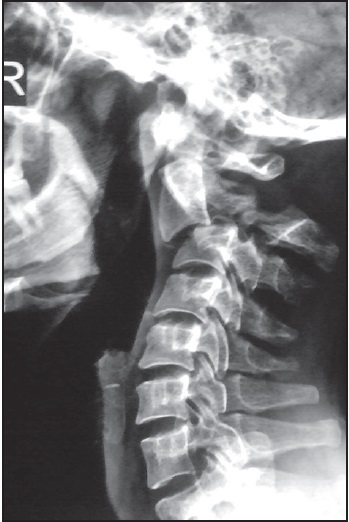 GCT affects cervical spine rarely and has been known to affect almost all vertebra in the human body. It has a predilection for fixed spine, that is, sacrum though it can affect mobile spine as well. GCT of cervicothoracic region poses a challenge for the surgeon because of the difficulty in approaching this region anteriorly. This situation is further compounded when GCT involves multiple contiguous vertebral bodies in this region and has already spread beyond the confines of its capsule. We report a case of GCT involving three vertebral bodies C7, D1, and D2 at cervicothoracic region who presented to us and was treated with triple corpectomy from the posterior only approach. This is the first ever case report of triple corpectomy and anterior reconstruction by a posterior only approach for GCT at the cervicothoracic junction to the best of author's knowledge. 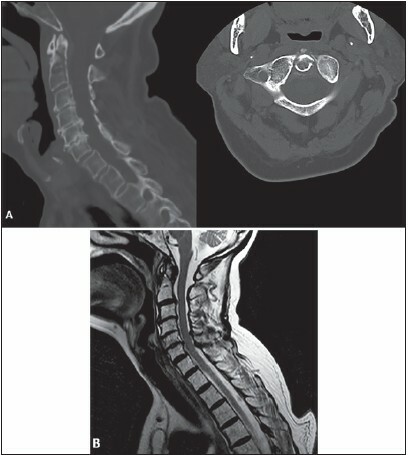 Cervical kyphosis in diastrophic dysplasia (DTD) is a very dangerous deformity which may lead to compression of neural structures resulting in tetraplegia or even. Treatment of this deformity is usually surgical, but no long-term follow-up studies are presented in the literature. Authors present a case of two children with DTD who underwent anterior corpectomy due to severe cervical kyphosis. The kyphotic deformity was corrected and the normal spinal canal width was restored. The effects of the correction remained stable for respectively 6 and 10 years of the follow-up period. The unique follow-up confirms that this type of intervention leads to an effective and long lasting results. 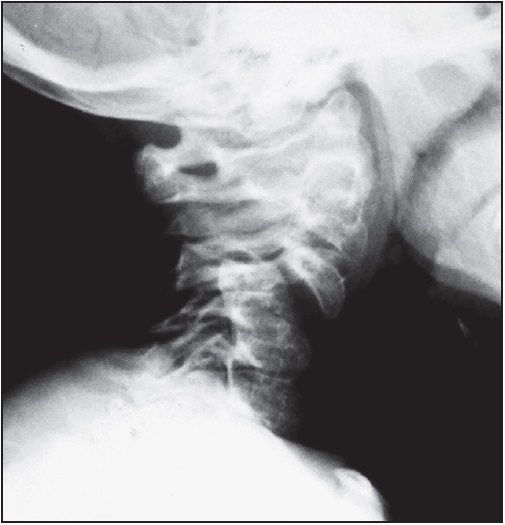 Significant cervical kyphosis in patients suffering from DTD may be treated surgically using anterior approach even in young children with a favorable and lasting results. Dural ectasia is frequently associated with connective tissue disorders or inflammatory conditions. Presentation in a patient without known risk factors is rare. Moreover, the literature regarding the treatment options for symptomatic dural ectasia is controversial, variable, and limited. A 62-year-old female presents with intractable, postural headaches for years. A lumbar puncture revealed opening pressure 3 cm of water. A computed tomography myelogram of the spine demonstrated erosion of her sacrum due to a large lumbosacral dural ectasia. An initial surgery was attempted to reduce the size of the expansile dura, and reconstruct the dorsal sacrum with a titanium plate (Depuy Synthes, Westchester, PA, USA) to prevent recurrence of thecal sac dilatation. Her symptoms initially improved, but shortly thereafter recurred. A second surgery was then undertaken to obliterate the thecal sac distal to the S2 nerve roots. This could not be accomplished through simple ligation of the thecal sac circumferentially as the ventral dura was noted to be incompetent and attempts to develop an extradural tissue plane were unsuccessful. Consequently, an abundance of fibrin glue was injected into the thecal sac distal to S2, and the dural ectasia was marsupialized rostrally, effectively obliterating the distal thecal sac while further reducing the size of the expansile dura. This approach significantly improved her symptoms at 5 months follow-up. Treatment of dural ectasia is not well-defined and has been variable based on the underlying manifestations. We report a rare patient without risk factors who presented with significant lumbosacral dural ectasia. Moreover, we present a novel method to treat postural headaches secondary to dural ectasia, where the thecal sac is obliterated distal to the S2 nerve roots using an abundance of fibrin glue followed by marsupialization of the thecal sac rostally. This method may offer an effective therapy option as it serves to limit the expansile dura, reducing the cerebrospinal fluid sump and the potential for intracranial hypotension. Remote cerebellar hemorrhage after cranial and spinal surgeries is a well-documented entity, so far concomitant supra- and infra-tentorial hemorrhage after spine surgery has rarely been reported in the literature. 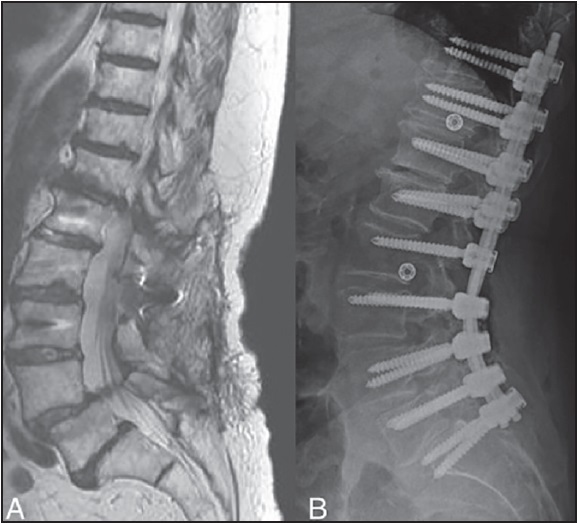 A 57-year-old woman presented with intractable low back pain and severely impaired mobility. One year ago, she underwent lumbar laminectomy and fusion with posterior spinal instrumentation between L2 and S1. She developed adjacent segment disease at the upper level of the instrumented vertebra. She had a revision surgery and underwent posterior laminectomy and fusion with bilateral transpedicular instrumentation between T10 and S1. She had severe headache, somnolence, and left hemiparesia 48 h after the surgery. Her emergent head computed tomography depicted intra-parenchymal hemorrhage in the right parietal lobe accompanying with subarachnoid hemorrhage, bilateral symmetrical cerebellar hemorrhages and pneumocephalus. She was treated nonsurgically and she got better despite some residual deficits. Symptoms including constant headache, nausea, vomiting, impaired consciousness, new onset seizure, and focal neurological deficit after spine surgeries should raise suspicion for intracranial intra-parenchymal hemorrhage. Patients with ankylosing spondylitis (AS) are at an increased risk of spinal fractures due to the altered spinal biomechanics. Moreover, it is difficult to treat these fractures due to the combination of ankylosis and osteoporosis. 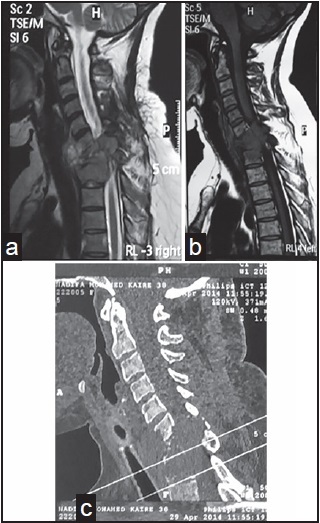 We report successful management of a C6-C7 vertebral fracture in a patient with AS. The patient improved in his neurological status and a good fusion was seen at a follow-up of 24 months.